It’s taken four seasons, but we’re finally getting to see what baseball phenom Bryce Harper can do when he’s fully healthy. So far through 2015 the Washington Nationals outfielder is hitting .344 with an on-base percentage of .471, a slugging percentage of .714, and an on-base slugging percentage of 1.185. Simply put, there is no stopping the 22-year-old, who’s already scored 58 runs and has 60 RBIs. Of course, since this is baseball, there’s one important category that we most certainly cannot afford to leave out: Home runs. 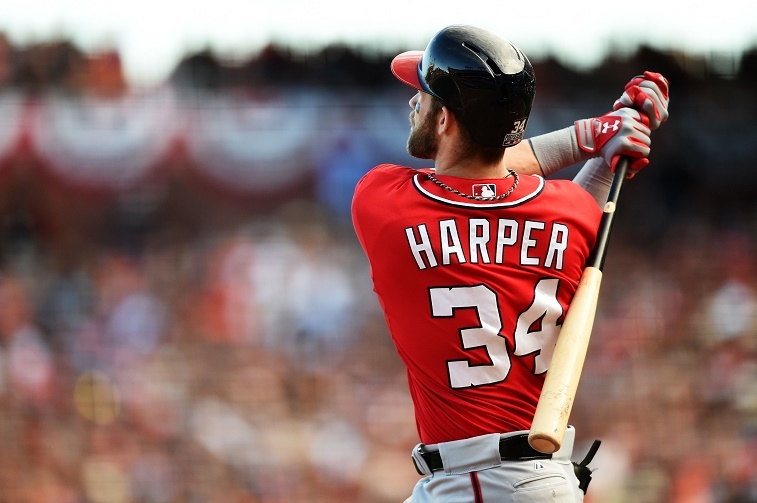 Harper is one of the best long ball hitters in the game right now and his 25 dingers on the year surely backs up that statement. And because of his insane power and prowess at the plate, most folks were eagerly waiting to see what kind of showing he could put on at the 2015 Home Run Derby. Unfortunately those who were expecting to see Harper consistently go yard on July 13 are going to be sorely disappointed. The superstar has decided to skip the event because his father — Ron Harper — is recovering from rotator cuff surgery. “Not having my dad throwing to me is a big issue for me,” Harper said, adding that his father “throws strikes” and knows where his “sweet spot” is. As much as we’d love to see Harper knock the ball out of the park, we can understand his reluctance to take part in the derby without the presence of his pops. Still, it does remove some of the glitz and glamour from this year’s event. With Harper’s absence, we have a hard time picturing the 2015 Home Run Derby being as exciting as it could have been. However, that doesn’t mean there hasn’t been some great individual showings in the past. With that in mind, here’s a look at the five best home run derby performances of all time. If you follow Major League Baseball, then you are well aware that Robinson Cano is struggling mightily in 2015. We’re already into July and so far his batting average is a measly .252, he’s hit just five home runs, and only knocked him 25 RBIs. Hopefully he’s able to use the upcoming All-Star break to find his game again. However, in the meantime, we cannot talk about Home Run Derby performances without acknowledging the show Cano put on at Chase Field in 2011. In a two-way battle between Cano and Adrian Gonzalez, the former Yankee was able to connect on one more dinger in the final round to come out on top. We think it probably had something to do with his connection to the man feeding him the pitches — his father. Bonus points for the father and son embrace after it was all over. “We take you back to another time, a different era, when Big Mac was still baseball’s most beloved, almost-mythical figure. And nine months after breaking the 70-homer barrier, he turned Fenway into his own personal Derby stage. He, too, didn’t “win” this Derby. (Ken Griffey Jr. did.) But in the first round, McGwire terrorized New Englanders from Kenmore Square to Kennebunkport with a then-record 13-homer round that amounted to 5,692 feet worth of bombage. His ultimate highlight: a 488-foot mortar that whooshed beyond the Green Monster, cleared the street, soared over a parking garage and hit a billboard above the train tracks, right next to the never-reached Massachusetts Turnpike. In 18 major league seasons, Bobby Abreu had never hit more than 31 home runs in a single season. Yet for one night in 2005 he seemed to turn into the greatest long ball hitter on the planet. Abreu hit 24 home runs in the first round — a record at the time — and finished with 41 in total on the evening. The next closest player was Ivan Rodriguez, who sent 20 balls into the stands. While that’s a solid showing, it pales in comparison to the damage Abreu did at Comerica Park on that summer night. The former Philadelphia Phillie was the clear winner that night, and so was everyone who was fortunate enough to witness his greatness. The whole point of the Home Run Derby is to witness the top long ball hitters in the game square off and crush baseballs. It really is that simple. And in 1996 — at Veterans Stadium in Philadelphia — Major League Baseball got the matchup that fans so desperately wanted, as Mark McGwire and Barry Bonds went toe to toe for home run hitting supremacy. In the end, it was the Giants slugger who would come out victorious by a score of 17-15. McGwire may have finished in second place that night, but let’s be honest, after a battle of that magnitude, there were really no losers that day. Josh Hamilton technically “lost” the 2008 Home Run Derby to Justin Morneau by being outhit 5-3 in the final round, but that score certainly doesn’t tell the whole story. What really happened was Hamilton crushed 28 home runs in the opening round, set a new record, and dazzled the crowd at the old Yankee Stadium. It’s one of those performances that transcends the event itself — Hamilton was in a ridiculous zone. It was only fitting that House that Ruth Built got to play host to one last epic long ball display. All statistics are courtesy of Baseball-Reference.com, ESPN.go.com, and MLB.com.